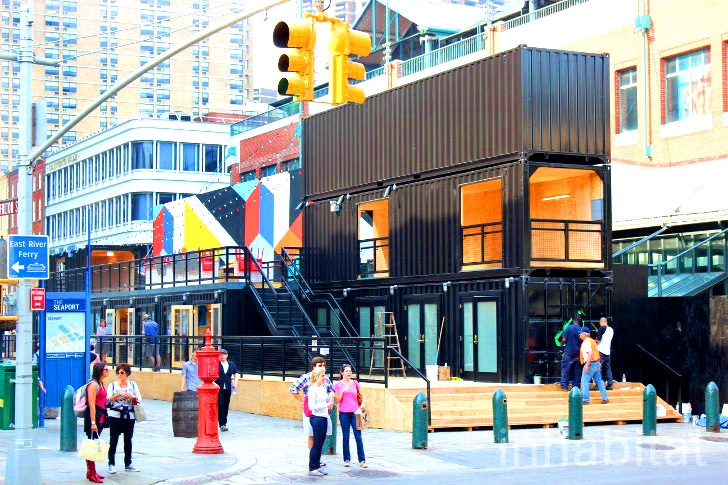 If you've been meaning to cross "drinking and shopping inside shipping containers" off of your bucket list (because that's clearly a common entry), don't miss your chance to do just that at South Street Seaport this summer. We caught up with SHoP Architects yesterday as they were putting some finishing touches on the three-story shipping container beer garden/mini-mall/food court they're building on Fulton St. for Howard Hughes Corp, and designer Sam Pepper told us that many of the units are already open for business. The repurposed container stalls are part of the seaport's SEE/CHANGE summer program, which will include concerts, happy hours, delicious artisanal foods and special events to help bring people back to the waterside area after Hurricane Sandy. While heavy rain did hamper construction last week, a good number of the new container shops and eateries have been serving customers since last weekend, and the SmorgasBar beer garden-style food court by Brooklyn Flea (the creators of Brooklyn’s popular Smorgasburg) seems to already be a hit with hungry visitors. The food and drink vendors (located on Front St.) include local favorites like Asia Dog, Blue Marble Ice Cream, Brooklyn Oyster Party, Brooklyn Soda Works, Kelvin Natural Slush Co., Landhaus, Milk Truck Grilled Cheese, Pizza Moto, Red Hook Lobster Pound, Rice & Miso Everyday and Fonda, but Brooklyn Flea plans to add more names to the bunch and rotate throughout the summer. If you need a cold beverage to wash down your meal, a bar located inside a refurbished shipping container has been pouring out beers, wines, and spirits, and an additional watering hole on top of another shipping container is in the works. SHoP says they hope to open the second bar (which will also have outdoor seating overlooking Pier 17) tonight. Those looking to pick up some souvenirs will also find an assortment of pop-up retail shops located inside reclaimed shipping containers on Fulton St. Confirmed vendors include Birdhouse Jewelry, Intaglio Antique Prints & Maps, Kate Durkin, Loyalty & Blood, Sheepshead Design, SKT Ceramics and It’Sugar, but Howard Hughes is still in the process of adding more tenants. SmorgasBar will be open throughout October, Sunday-Thursday from 11am-10pm and Friday-Saturday from 11am-11pm. For more photos of the shipping container mall, click through our gallery. While heavy rain did hamper construction last week, a good number of the new container shops and eateries have been serving customers since last weekend, and the SmorgasBar beer garden-style food court by Brooklyn Flea (the creators of Brooklyn's popular Smorgasburg) seems to already be a hit with hungry visitors. The food and drink vendors (located on Front St.) include local favorites like Asia Dog, Blue Marble Ice Cream, Brooklyn Oyster Party, Brooklyn Soda Works, Fonda, Kelvin Slush Company, Landhaus, Milk Truck Grilled Cheese, Pizza Moto, Red Hook Lobster Pound and Rice & Miso Everyday. Brooklyn Flea plans to add more names to the bunch and rotate throughout the summer. If you need a cold beverage to wash down your meal, a bar located inside a refurbished shipping container has been pouring out beers, wines, and spirits. An additional watering hole on top of another shipping container is in the works. SHoP says they hope to open the second bar (which will also have outdoor seating overlooking Pier 17) tonight. Those looking to pick up some souvenirs will also find an assortment of pop-up retail shops located inside reclaimed shipping containers on Fulton St. Confirmed vendors include Birdhouse Jewelry, Intaglio Antique Prints & Maps, It'Sugar, Kate Durkin, Loyalty & Blood, Sheepshead Design and SKT Ceramics. Some of the shops are still empty but but Howard Hughes is still in the process of adding more tenants. Workers were putting some finishing touches on the containers yesterday. The shipping containers were stacked one on top of another in an asymmetrical formation.